333 West Wacker Drive is a highrise office building in Chicago, Illinois. 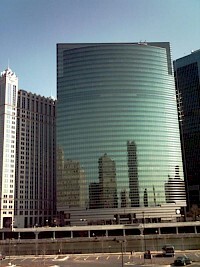 On the side facing the Chicago River, the building features a curved green glass façade, while on the other side the building adheres to the usual rectangular street grid. The architecture firm Kohn Pederson Fox Associates who designed 333 also designed the high-rise buildings 225 W Wacker to the east, and 191 N Wacker Drive to the south.